This fried ice cream is the easiest thing in the world, but it really takes the classic summer favorite to the next level. I’ve got a bone to pick, and it’s with winter. I put away my heavy winter coat at the beginning of March in good faith. I was giving winter the benefit of the doubt. Okay, winter, you’ve been rough, I thought, but I trust you’re going to go away quietly. Not make a scene. Just head back to Siberia where you belong. But winter is not going away quietly. It’s going out kicking up every wind and flurry and frosty morning on its way. So the Sunday Supper contributors and I are declaring war. This Sunday, it’s all about spring time. Who cares that I’m still wearing my winter coat? Who cares that the trees are still bare? Spring is here! I’m eating asparagus and salad and sprinkling fresh, bright green herbs on everything! And most importantly, I’m eating ice cream. And liking it too! You’re probably familiar with the fried ice cream served in Mexican restaurants. 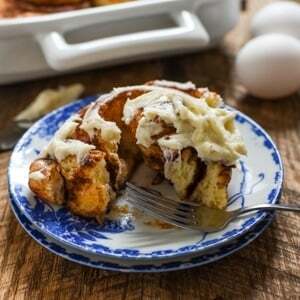 A crispy warm batter encasing cool, creamy ice cream and finished with a drizzle of honey. In other words, the best thing ever. Remember that Cheater Pho Bo? Yeah, apparently I like shortcuts in the kitchen, because this is Cheater Fried Ice Cream. This version nails the crunchy meets creamy texture of fried ice cream without having to worry about a melty, milky mess. It has graced the table of many a Mennonite potluck and is always a crowd pleaser. The ingredients are simple. 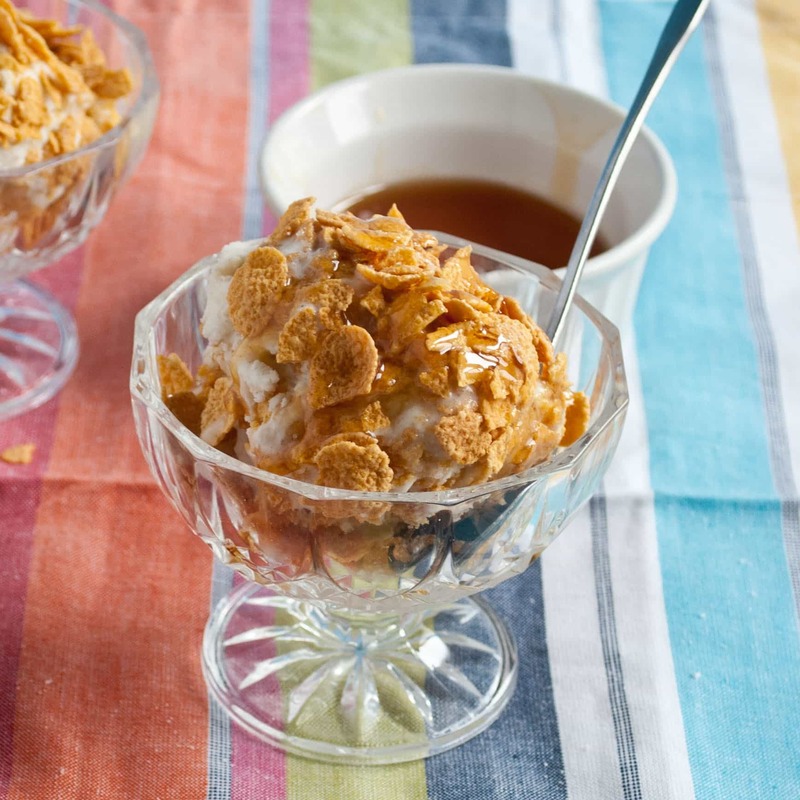 Ice cream and whipped topping are whisked together and spiced with cinnamon then covered in crispy, sugared corn flakes and frozen. It takes about 10 minutes to throw together and tastes just as special as the real thing. Check out all the other ways the Sunday Supper team is taking it to winter below the recipe! **Before you prepare this dish, you'll want to decide if this is a make ahead dish that you need to grab and go, or if you want the topping to be warm, like traditional fried ice cream. It's delicious both ways, it just depends on what you prefer. The warm topping requires that you be able to serve the dish immediately after the topping is cooked, so it requires a little more planning. For the ice cream base, combine the softened ice cream, whipped topping, and cinnamon in a large bowl. Use a stand mixer, hand beater, or blender to combine. Spread ice cream mixture evenly in a 9 x 13 inch pan and place in the freezer. For the topping: In a large skillet over medium heat, melt butter. Add cornflakes and sugar and fry for about 5 minutes, stirring occasionally. Remove from heat and set aside to cool. If you're freezing this ahead of time, layer the cornflake mixture on the ice cream as soon as it's cool then freeze for 2 hours or overnight. If you want the topping to be warm, wait to prepare the cornflake topping until 30 minutes before you're ready to serve, then pull the pan from the freezer, top with warm topping, and serve immediately. Either way, cut the dessert into squares and serve with honey or chocolate sauce. 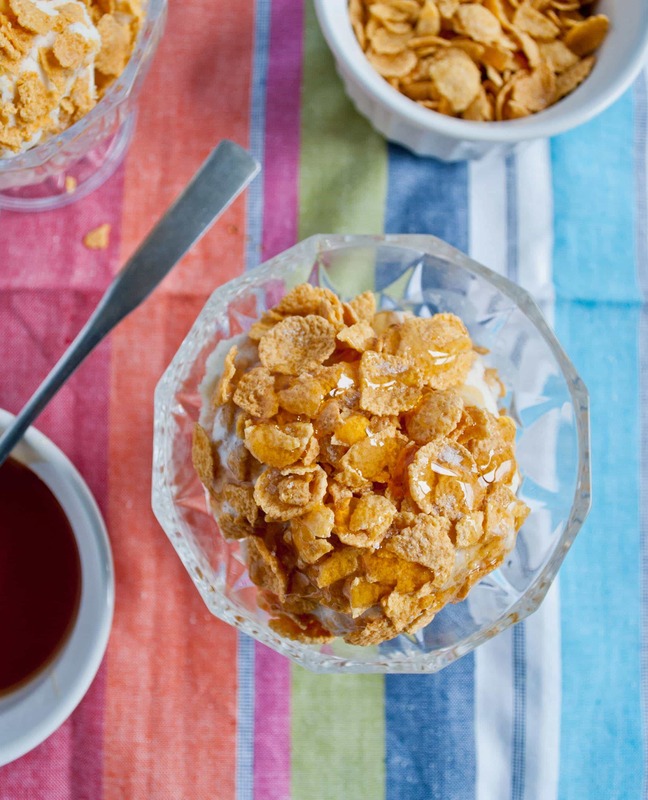 For a fancier presentation, scoop ice cream mixture into individual serving bowls or glasses then sprinkle with cornflake mixture. 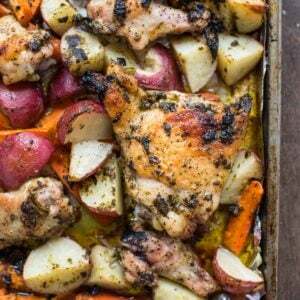 We’re celebrating Spring with Sunday Supper! What an innovative and clever way to make fried ice cream! Well done! I remember a fried ice cream recipe from a book I lost ages ago. Love this easier version! I eat ice cream year round, there´s no season for it! You’re right! Ice cream is good any time of year! Fried ice cream is one of my favorite desserts. I never knew that it was commonly served in mexican restaurants. I stumbled upon it while looking for some fancy dessert ideas a couple of years back and I have to confess I took some time to get it right. Your recipe looks much easier then mine and it would be more convenient when I am in a hurry. thanks for sharing! Kudos to you for conquering the real thing! Hopefully this will be a nice substitute when time is short. 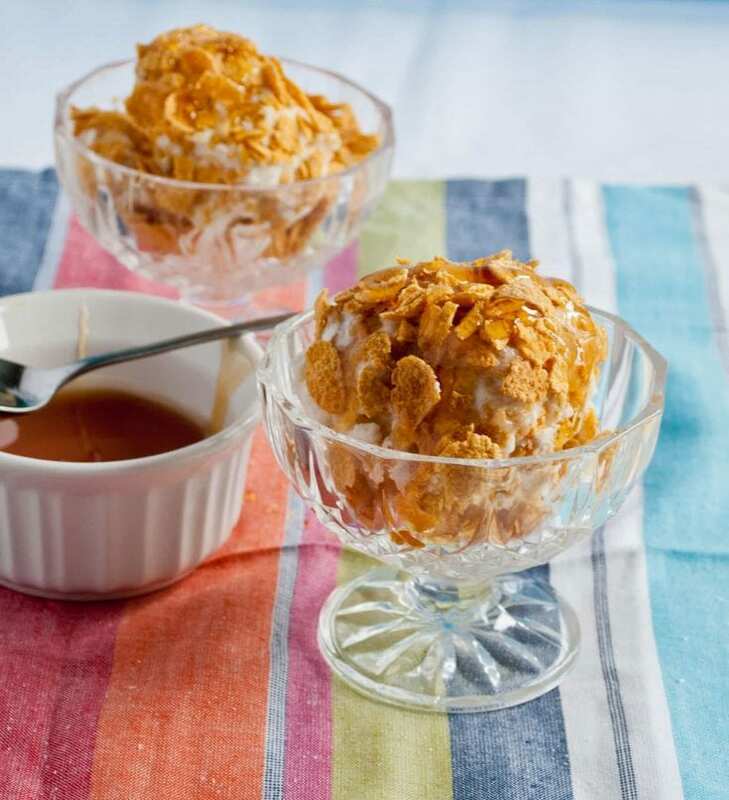 I have never made Fried Ice Cream at home and I can’t wait to try this delicious recipe! My husband would love this, especially if it was made with rum raisin ice cream. Filing the recipe away for his birthday. Great idea! I don’t think I’ve ever had rum raisin ice cream before but that sounds amazing! 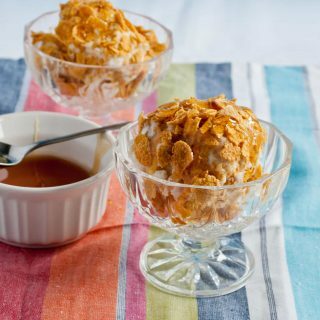 I love fried ice cream and I love your easy version! YUM! Winter is lingering around my home too. This ice cream looks so yummy and not as daunting to try as traditional fried ice cream. Yum! Not daunting at all. You’ll have fried ice cream glory in no time! Can I tell you how much I love fried ice cream? Seriously. This looks way easier and just as crisp and yummy. It might be a shortcut, but it looks yummy!!! Our chef in college used to make this. It was everyone’s favorite! I saw someone on TV do this once, it looked amazing but yours looks better and more easily achieved! Agreed. This time of year I start to crave it, even though we still have freezing temps!